Anthropology has long been associated with an ethos of "engagement." The field's core methods and practices involve long-term interpersonal contact between researchers and their study participants, giving major research topics in the field a distinctively human face. Can research findings be authentic and objective? Are anthropologists able to use their data to aid the participants of their study, and is that aid always welcome? In Engaged Observer, Victoria Sanford and Asale Angel-Ajani bring together an international array of scholars who have been embedded in some of the most conflict-ridden and dangerous zones in the world to reflect on the role and responsibility of anthropological inquiry. They explore issues of truth and objectivity, the role of the academic, the politics of memory, and the impact of race, gender, and social position on the research process. Through ethnographic case studies, they offer models for conducting engaged research and illustrate the contradictions and challenges of doing so. Anthropology has long been associated with an ethos of "engagement." The field's core methods and practices involve long-term interpersonal contact between researchers and their study participants, giving major research topics in the field a distinctively human face. The fact that these interactions frequently cross social parameters, including class, race, ethnicity, and gender, raises important questions. Can research findings be authentic and objective? 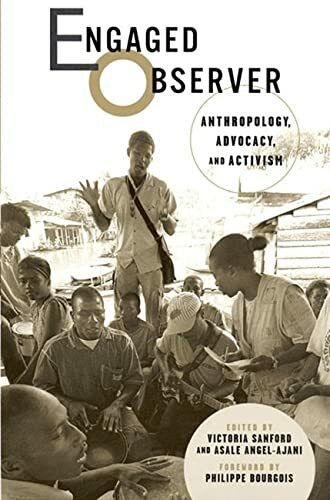 Are anthropologists able to use their data to aid the participants of their study, and is that aid always welcome?In Engaged Observer, Victoria Sanford and Asale Angel-Ajani bring together an international array of scholars who have been embedded in some of the most conflict-ridden and dangerous zones in the world to reflect on the role and responsibility of anthropological inquiry. Working in a variety of different locations, including Italy, Chiapas, Guatemala, Colombia, Palestine, El Salvador, Cambodia, and the United States, the contributors report on their research with survivors of war, occupation, massacres, and displacement. They explore issues of truth and objectivity, the role of the academic, the politics of memory, and the impact of race, gender, and social position on the research process. Through ethnographic case studies, they offer models for conducting engaged research and illustrate the contradictions and challenges of doing so.Victoria Sanford is an assistant professor of anthropology at Lehman College, CUNY. Asale Angel-Ajani is an assistant professor in the Gallatin School at New York University.